Brush chicken breasts on both sides with olive oil and sprinkle with salt and pepper. Bake on a baking sheet for 35 to 40 minutes, until no longer pink in the center. While chicken is baking, add all salsa ingredients to a food processor and pulse using the chopping bladeuntil finely chopped. Remove chicken from the oven and allow it to cool. Once cool enough to handle, cut each breast into three or four smaller pieces and add to the food processor. 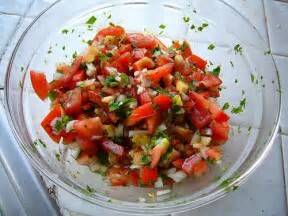 Add chicken to bowl with salsa and mix well with a fork. Refrigerate for at least two hours until chicken salad is chilled.